So, you’ve decided to take the leap into the lap of luxury and purchase a diesel pusher motor home. Isn’t life great? The diesel pusher, Class A recreational vehicle, or motor coach is the ultimate in travel comfort if you are the type who likes to take your time and set your own schedule without being tied down by hotel and plane reservations and itineraries. In one of these fine RVs you will have all of the comforts of home and a few extras thrown in. At an online dealer like PedataRVCenter.com you will find the new or used diesel pusher motor home to fit all of your travel needs along with tools to help make the purchase painlessly simple. A diesel pusher is the largest and most powerful type of recreational vehicle on the market. The diesel engine gives it more efficient power so that it can carry more weight. Some models are rated to tow 10,000 pounds or more. A diesel pusher motor home is built on a chassis that is similar to a full sizdiesel pusher motorhomee bus. This type of RV is also the most luxurious. With all of the space available, you will find features like refrigerators, washers and dryers, roomy seating areas, and a full-size bath. Holiday Rambler, which you will find at Pedata RV, is a prime example of the standard of excellence you will find in the diesel pusher motor home of today. If you are considering purchasing a brand new diesel pusher you can expect a price ranging anywhere from around $140,000 to over $400,000 depending on the make and model that you are looking at. So, you see that there is a diesel pusher motor home for nearly any budget. If you buy from a wholesaler like Pedata, you can save thousands of dollars off the price you would pay for a new Holiday Rambler at other dealers and still get all of the features and options that you want. 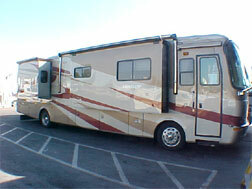 Other buyers are more interested in buying a pre-owned diesel pusher motor home. You can save money upfront by doing this because of the depreciation principle. Once a brand new RV leaves the lot it loses a lot of value in those first few weeks and months and then it slows and levels off. You can find a wide selection of quality pre-owned diesel pusher motor homes in our online listings from all of the leading RV companies. To finance your new diesel pusher, you may be thinking about taking out a loan at your bank or credit union. A good RV dealer will have access to loan products that are specifically designed for new or pre-owned recreational vehicle buyers. You can be pre-approved for your diesel pusher motor home loan before you decide on any RV and know exactly how much you can afford to spend. These lenders have flexible financing lengths and terms with competitive interest rates that you will not find anywhere else. A diesel pusher motor home is a great investment in your future happiness and recreational enjoyment. You will love the freedom that it gives you. You will be able to take your car, boat, and even the kitchen sink with you out on the road. Whether you are interested in something that you and the family can take on your trips out to the dunes for some four-wheeling, or if you want to travel in comfort when you head out for a summer of visiting family and friends, a diesel pusher is the perfect solution. So, get out of your chair and get behind the wheel and into the driver’s seat.